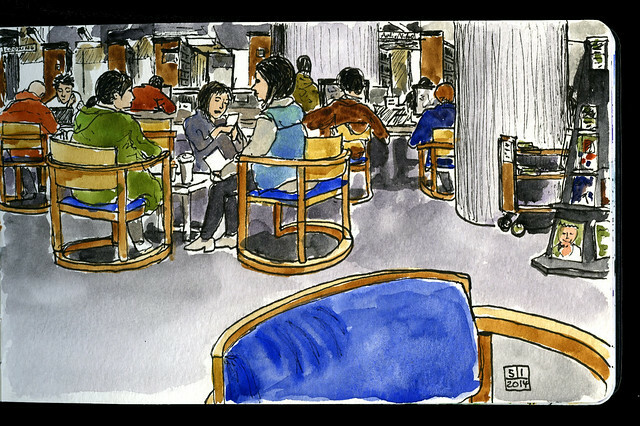 I need to go back in time a bit: On January 5, we had the biggest ever meetup of the Vancouver Urban Sketchers. Over 50 people signed up, and I think 45 of them actually came! Luckily, I had picked the downtown main branch of the Public Library, a cavernous building which can easily absorb that amount of sketchers without sustaining structural damage. Although when I told this to a friend of mine, she said “I would never make that resolution. In fact, I’ve decided not to draw this year at all.” And it’s true, she never draws.